…So that their children may take selfies and share them with their 40 million followers on Instagram (like a certain buxom brunette…). There has been no shortage of words written or spoken about the self-indulgence, narcissism, laziness and entitlement of Millennials. In a 2014 survey, 65% of Americans agreed that Millennials are entitled. A full 70% responded that “selfish” is an accurate descriptor of them. Each of us probably has a first-hand story of their insouciant arrogance in the work place. They care not for hierarchy. They speak their minds and push back freely, often over email and text. And they do all this, gasp, from their perch on the lowest rung of the ladder. They have not yet earned the right to challenge our hard-won authority! Except, somehow, they did not get this memo. At a certain point, when a whole cadre of people advocate for the disdain of any one group, you have to look at the people raising their fists in the air and wonder why they’re so upset. Millennials do put themselves squarely at the center of their indulgent use of social media. They do show little concern for tradition, having no interest in the steady career path and putting off marriage and kids. They don’t want to own anything, like homes or cars, no matter how this might impinge economy. They do buck the corporate ladder in favor of their whims and preferences, whether that’s constant job-hopping, eschewing the desk job or demanding a flexible work schedule. But they’re also incredibly innovative. Their digital native-ness allows them to see opportunities for new technologies that wouldn’t occur to most in older generations. They fearlessly exploit these opportunities, scrappily starting all manner of projects and companies, even if on the side because, hey, you never know where it could go. They are globally connected, highly networked and savvy at using these networks to promote themselves and their ideas. Technology has made their minds nimble and adaptive; for this generation, learning new technologies and how to use them strategically seems almost effortless. They’re disrupting most every industry, finding more efficient ways to do things, often to their benefit. Uncomfortable admission 1: Might we older folk, we Gen Xers and Boomers be…envious? Wouldn’t we love to know how to make six figures of passive income on Instagram or YouTube? Aren’t we jealous of their optimistic fearlessness in crafting the careers and lives they want? Don’t we wish we could become billionaires off photos that self-destruct after 10 seconds? Might we actually have a thing or two to learn from them? Adding insult to injury, it was our effort, our sacrifices and our encouragement that afforded their devil may care attitude, their ability to be the unique people we told them they were. We did the hard work—climbing the corporate ladder, staying put in our one, linear, sometimes boring career path, making the financial and personal sacrifices—and they reap the rewards. But the thing is…isn’t this what we did all the work for? So that our children might have it better than us? So that they wouldn’t have to make the sacrifices we had to make? So that they might be able to create lives doing what they want? Something interesting happened to Millennials on their way to adulthood: The world as we all knew it imploded. The most optimistic generation ever—the generation we told could do whatever their hearts desired, could be anything they could dream up—was handed the bleakest socioeconomic outlook in nearly a hundred years. Compared to Gen X and Boomers, Millennials, of which there are about 80 million, have far less wealth now than their predecessors did at the same age thanks to record student loan debt. They are the most educated generation in history, with nearly one-third of older Millennials holding college degrees. But in a knowledge-based economy, the non-degreed of the cohort will fall further behind, entrenching the already widening economic divide that much more. They are the most racially diverse generation in American history; 43% of Millennials are non-white. But the non-white sectors of Millennials are particularly plagued by poverty. Millennials also face little to no promise of receiving the benefits they’re paying into, creating huge uncertainty over how and when they will retire. Within this dire socioeconomic context, what emerges is a portrait of a highly adaptive, resilient generation, stubbornly optimistic against all odds. They are delaying marriage and kids because they lack the economic foundation to enter into this stage confidently. They rightly know they can’t take on the additional debt of a house or car, so they’ve invented the share economy to get around it. While they can’t yet afford to save much for the future, they learned from the 2008 crash and carry little credit card debt. They cobble together odd jobs or freelance because in many cases, they have no choice. And yet, they believe America’s brightest days are ahead (unlike most in older generations, who do not). Uncomfortable admission 2: Might we want overly optimistic, even overly confident people at the helm of righting our socioeconomic ship? Might there be no better-equipped generation than Millennials to apply their fearlessness, their nimble minds and their proclivity for innovation to problems that could benefit from some fresh thinking? And, it cannot be ignored, problems they did not create? If you think Millennials are monsters, well then they are the monsters we created. And, one could argue, the monsters we’ve been intending to create since the grand experiment of this nation began. And, ironically, they just might be the exact monsters we want to try to save us…So that, once again, our children and theirs can do better than us. Read on below for a complicated portrait of Millennials, as they transition from emerging adulthood into adulthood and what it says about how they might rise to the challenge in precarious economic times. To the Millennials in our readership: No pressure! But you guys are so special, you’re uniquely capable of handling this, right? Well, thank goodness the EU and Greece finally cut a deal. There sure was a lot of uncertainty, concern and some panic in the investment markets over a Grexit. In mere days, the term “Grexit,”—defined as Greece exiting the Euro—was born and became official journalistic and political parlance. Welcome to the world where a term coined to describe an apparent financial certainty spurs an effort to make it not so certain. At 175% of debt-to-GDP and growing, Greece will likely never be able to pay its debt. But for now, there looks to be no Grexit. It’s safe to say that right now the Germans hate the Greeks and the Greeks hate the Germans. With such animosity, how was fiscal compromise possible? It should be obvious…He who has the gold makes the rules. Given the significant economic weakness of many countries in the EU, the economic buck stops squarely with Germany. This was not a compromise between Greece and the EU. It was the Greeks following German orders. And with that, it seems that autocracy has overtaken democracy in the EU. Is such obvious “do as I say or else” going to bring the countries in the EU closer? It seems more likely the opposite will occur. More and more countries are going to feel less and less comfortable in the room with Germans. To make matters worse, at some point the weaker countries are going to realize their economic problems are Germany’s gain. Their weak economies create a weak currency. The weaker the Euro, the more competitive are German exports. Oh what a tangled web they wove in creating the EU and the Euro. Odds are high that political collaboration between sovereigns in the EU is going to devolve into fear and animosity between cultures that have little in common. Do we really believe these very different cultures are going to work together to, in effect, all become Germans? The challenges of this cultural mishmash seem almost as obvious as the eventual outcome of an effort to layer a large bloated bureaucracy (the EU) on top of numerous existing large bloated bureaucracies (the sovereign countries). As if growing more and more government is a recipe to create a more competitive economic environment. Sometimes I like to say that oft quoted expression a different way…Experience is what you get when you didn’t get what you expected. What you wanted and what you expected are really not much different. You did what you did to do what you were supposed to do, and for some reason the result of your effort didn’t prove out how you expected. Maybe you did exactly what was expected of you, but circumstances changed—so much so that what you did lost relevance or impact. Everyone in the oil patch today has a bit of this “experience.” No one expected, and certainly no one wanted, oil and gas prices to fall to the point of seriously affecting the cash flow at your company. With the drilling rig count having fallen from 1,900 to under 900, it’s reasonable to expect the overall fall in oil and gas upstream capital expenditures will be rather dramatic. Current estimates in the difference in expenditures from 2014 to 2015 range from 30% to 50%. The consequence should be obvious for both the upstream and oilfield supply and services industries…less cash flow at the company level has to lead to less cash flow for G&A. Included in G&A is compensation. The bottom line: Everyone in the oil patch is about to take a cut in pay. How can companies afford to keep pay at current levels if their revenues are dropping 30% to 50%? Should we be in the pursuit of happiness, or should we be happy in the pursuit? The search for happiness certainly keeps a whole bunch of professional sociologists and psychologists busy. It has spawned a cottage self-help book industry, promising all sorts of shortcuts and secrets to happiness. Pharmaceutical companies have spent and earned billions developing and selling happy pills, which are prescribed at record rates these days. The marketing strategy of virtually all consumer product companies is to make us believe their products will bring us some version of happiness. This product will make us feel accomplished. That product will make us feel like we fit in. This product will make us healthier. And that product will make our life easier. Research shows it is the act of purchasing that elicits the great majority of our happy feelings. We make a personal decision, express our individuality, bear fruits of our labor. Consuming produces a brief emotional high. But not long after the purchase, we return to the same ole same ole, the grind of life, the burden of carrying all our emotional rocks around. The bliss is fleeting, the promise of some perpetual state of happiness unfulfilled. It seems many of us have gotten the pursuit of happiness backwards, as if happiness is the ultimate destination to seek. Rather, it may be the pursuit and accomplishment of individual goals that defines a happy world. Maybe happiness is accepting that the better than expected and the worse than expected are always going to occur. Just because something better than expected occurred doesn’t mean that’s what we should always expect. And just because something worse than we expected occurs doesn’t mean we have to be unhappy. It just means we have another new experience and another new challenge. How could life be happy without such? Millennials are the most racially diverse generation we’ve seen in this country, in large part due to the influx of Hispanic and Asian immigrants over the past fifty years whose children are in the Millennial generation. We were curious how other generations compared. 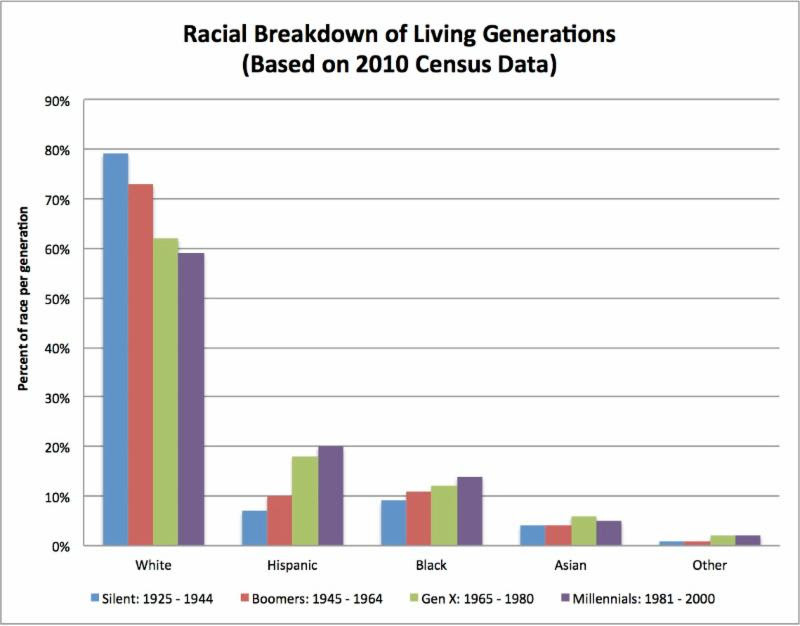 The following chart shows the racial breakdown as a share of all living generations based on 2010 Census data. In 2014, median weekly earnings for full-time wage and salary workers age 16 and older were $791. That means that half of these workers earned at least $791 per week and half earned less than that amount. 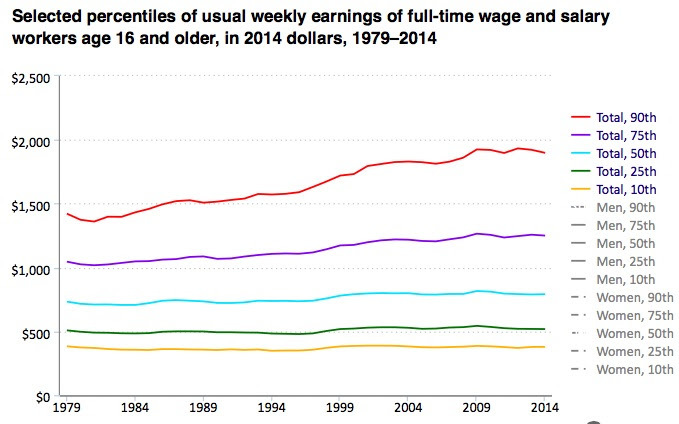 In 1979, median weekly earnings in 2014 dollars were $733. So what we call “real” or inflation-adjusted median weekly earnings increased by about 8 percent over that 35-year span. Over that same period, real earnings for the highest paid 10 percent of workers—those whose earnings were at or above the 90th percentile—increased from a minimum of $1,422 per week in 1979 to $1,898 per week in 2014, a gain of 33 percent. By contrast, real weekly earnings for the lowest paid 10 percent of workers (or those whose earnings are below the 10th percentile) were basically unchanged over the period, as these workers earned less than $383 per week in 1979 and less than $379 per week in 2014. Women’s real median weekly earnings increased 30 percent over the period, from $553 in 1979 to $719 in 2014. By contrast, men’s median weekly earnings changed little over the 1979–2014 period. The highest paid 10 percent of women workers earned at least $1,621 per week in 2014, compared with $970 per week in 1979—a 67-percent increase. For men, the highest paid 10 percent earned a minimum of $2,094 per week in 2014 and $1,565 per week in 1979, a 34-percent increase. Real weekly earnings also increased over the period among the lowest paid women, whereas they decreased for men in the lower paying groups. The average Millennial has 250 Facebook friends. 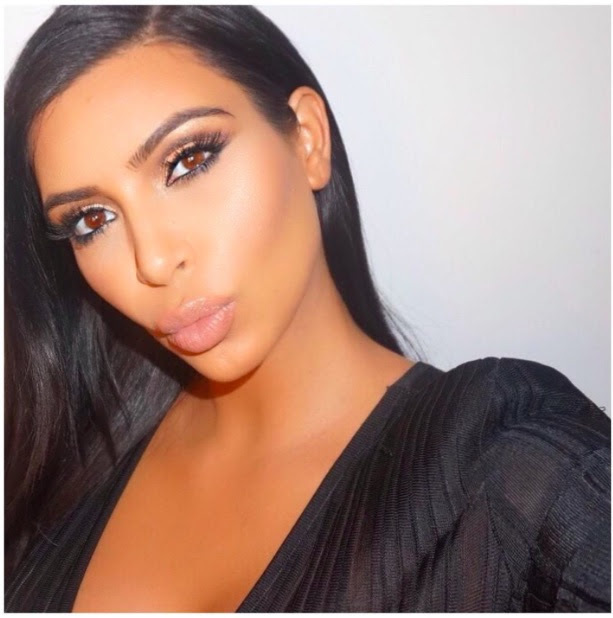 55% have posted a selfie, yet 90% of Millennials believe that people share too much about themselves online. Compared to older generations, Millennials are the least trusting of others, with only 19% saying others can be trusted. Yet, they hold comparably favorable views about business and government. The Millennials lead all generations in share of out-of-wedlock births; 47% of births to Millennial women were outside of marriage at survey time. Yet Millennials agree with older generations in a disapproval of this trend, believing that society will suffer as more children are raised by one parent. More Millennials than any prior generation view themselves as politically independent. Only 31% of Millennials view Republicans and Democrats as having big differences (compared to 58% of the Silent generation, who see the parties as largely different). Millennials are the least certain to believe in God without doubt and the least likely to affiliate with religion. Yet, they are more conservative on abortion rights than all older generations. They are very liberal about some things, but not about others. Nearly 70% support gay marriage. Yet their opinions about gun control are in line with all older generations, more or less split down the middle, but slightly more pro gun rights than Gen X and Boomers. 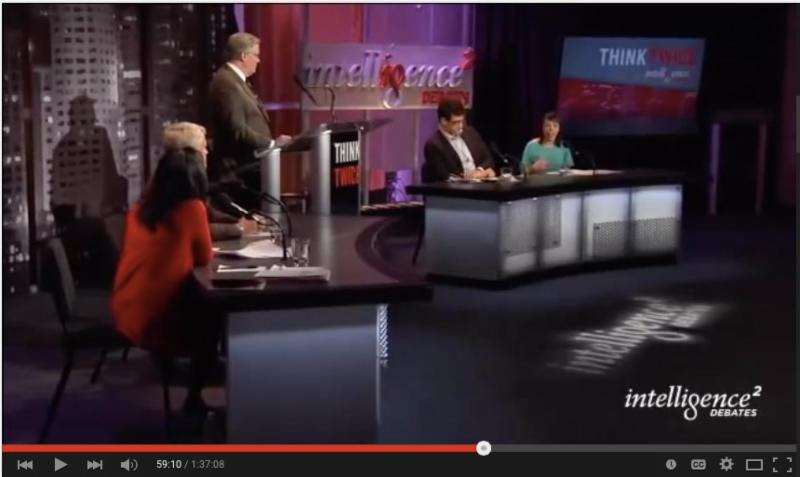 An Intelligence Square debate tackled this very question. No generation since the Greatest Generation has been handed such dire socioeconomic circumstances. But unlike Millennials, the Greatest Generation didn’t grow up under unprecedented prosperity. Do Millennials have the skills, humility, tenacity and know-how to dig our country out of a mess in the same way the Greatest Generation did? Or are they too self-centered and up against forces so strong that they’re doomed to be the first generation that doesn’t do better than their parents? Watch for a fascinating, spirited debate and ponder: Is this debate just one more chapter in the annals of old, cranky folks decrying and fearing the changes brought on by young folks? Or is it different this time? In a TEDx Talk, Scott Hess, an executive at a global youth research firm and a Gen Xer who got his 15 minutes as the poster child of his generation’s insouciant arrogance decades before, walks us through all the many ways Millennials are better than past generations and why this incites envy in the rest of us. This past February, Gallup’s CEO wrote an op-ed debunking the hollow metric that is our unemployment rate. Simply put: the job market has not recovered since the crash. Too many new jobs are part-time, low skill and low paying. By exploiting their vast digital networks, ever- adaptable Millennials are responding by freelancing more than any prior generation. Part need, part preference, their flexible approach to work appears to be changing the nature of work on a broad scale, joining the weak economy in slowly killing off the 9 to 5. The Atlantic recently debunked many of the myths around financial affairs and asset ownership of Millennials. 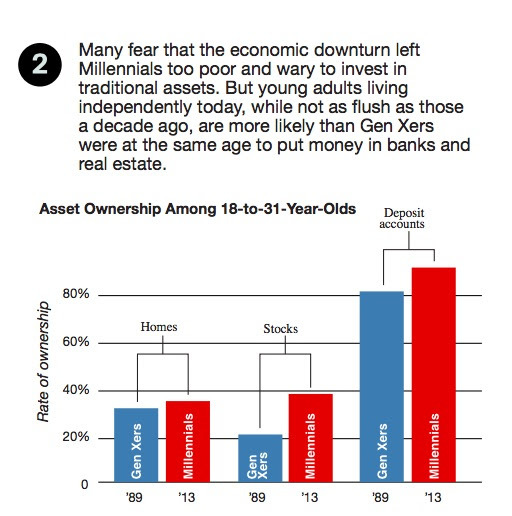 While they’re carrying much more student loan debt than prior generations, they have more in asset ownership than Gen Xers did at the same age. They also report to have learned much from the Great Recession, socking away more in savings than Gen Xers did when they were younger. Much has been said about “Nownership,” or the Millennial trend of remaining asset light and instead choosing the share economy. But a new survey indicates that Millennials do hope to own a home; 69% of Millennials reported a belief that owning a home is smart decision, but 25% believe they’re not in a financial position to buy. Interestingly, white Millennials were more likely than minority Millennials to report that home ownership felt out of financial reach. Young women were also more likely than young men to report the same. The New York Times caught up with Barbara Bush, daughter of President George W. and Laura, to discuss her work with Global Health Corps, the nonprofit she founded. And to drive home a point: Millennials, who were introduced to the idea of service in elementary and high school, are shaping up to be widely charitable. The perception that they were stingy with their money comes from how infrequently they donate through corporate giving programs. In 2014, 84% of Millennials made a charitable donation. Unlike their parents, many of whom have traditionally donated through work, 78% of Millennials made donations of their own accord and outside of work. In this thought provoking podcast, its participants discuss the uncomfortable truth of Millennials and their perceived entitlement: They are the exact result of our decades-long quest to produce constant generational betterment and to provide a broad social safety net. Like it or not, according to this podcast, we have long since been on a path to a culture where people don’t have to work or can work less. Now, many are abstaining from traditional work or working in ways that looks wildly different from the past, and this is unnerving to older generations. A 360 degree defense of a generation that, according to this author, is simply trying to pick up the pieces, adapt amid chaos and uncertainty, truck on and still create the prosperous lives they were promised as kids. Mississippi has its share of issues, but money there goes farther relative to all other states. 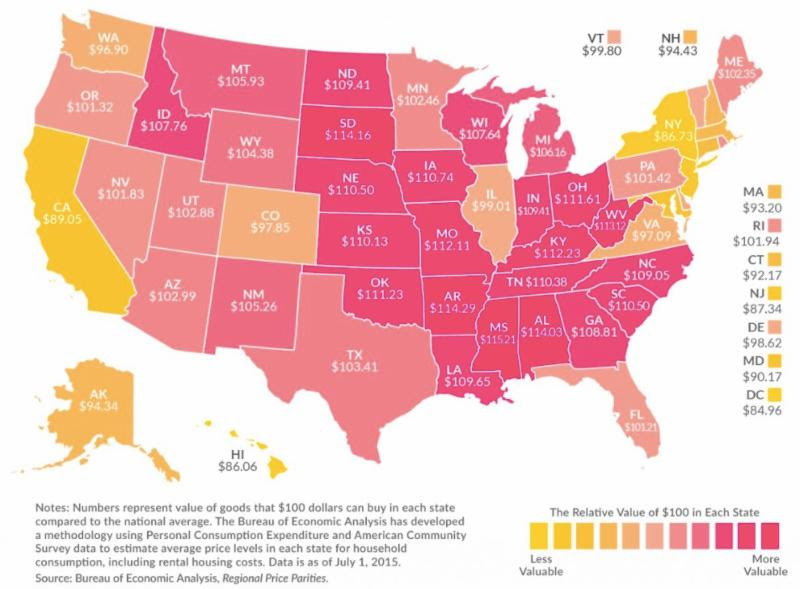 Washington DC and Hawaii see the least relative value of their money. 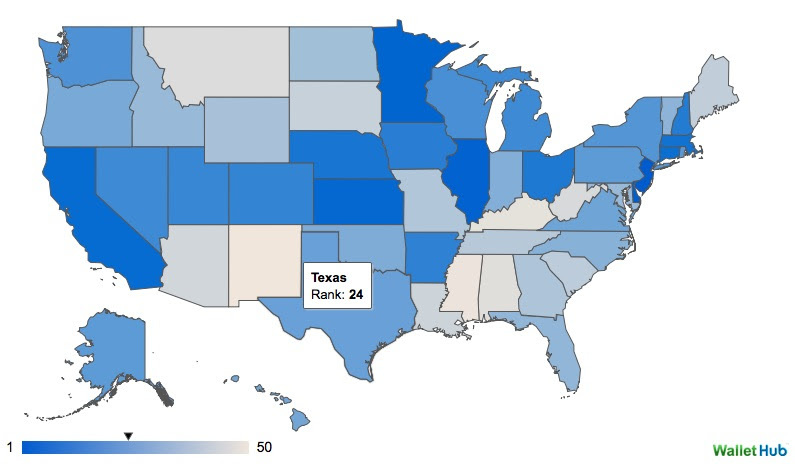 Click the link or interactive map to learn where each state falls on the spectrum of government dependence and to see the criteria used to rank states. The deeper the blue, the less dependent on federal government a state is. Texas falls right in the middle. Seventy percent of change programs fail to achieve their goals. What gives? McKinsey believes that change management is stuck in the pre-digital era. Read on for their advice on how to apply technology to greatly improve the odds and sustainability of your internal change management plan. Piggybacking nicely on the topic of overly confident Millennials and a cultural judgment of that, research shows managers’ positive ratings of their employees caused employees to feel confident, supported and thus optimistic about their capacity to improve and grow. Conversely, those whose managers gave tougher reviews felt discouraged and believed success was impossible. Sure, it remains in large part up to the employee to deliver, but the role of optimistic support from the manager is undeniable. Calorie intake peaked in 2003, and we are currently witnessing the first stable decline—a trend that cuts across most demographics—since we began tracking such statistics 40 years ago. Obesity rates of adults and school-aged children are showing signs of stabilizing, and they have begun to come down for the youngest children. There is no obvious movement that can be credited for dropping caloric intake, but researchers point to a 1999 CDC report that showed worsening obesity in all 50 states as a watershed moment. 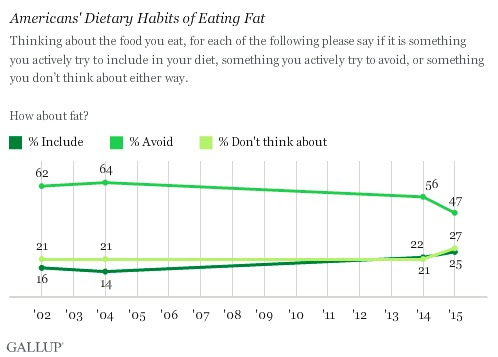 On the same topic, interestingly, Americans aren’t avoiding fat and salt as strictly as they once were. While efforts to decrease soda consumption seem to have had an impact, efforts to limit salt intake have not. And as more research shows that fat found in cheese, butter, eggs and meat are actually beneficial, Americans seem to be responding by digging in.